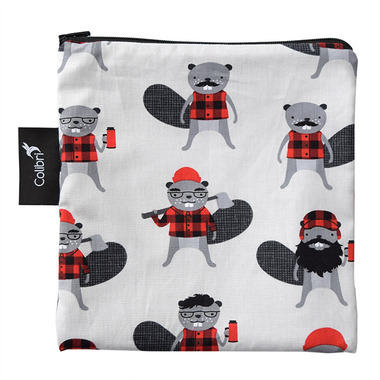 Colibri's Reusable Snack Bags are eco-friendly, practical and fun! Featuring a water resistant nylon liner, our snack bags are bpa free, and FDA approved as food safe. Zippers are lead and nickel free and CPSIA tested. 7.5" x 7.5" This size is great for sandwiches, bagels, muffins etc. I bought it as a gift and the person was very happy about the size and the cute print. Cute print! Decent size for snacks. I ran out of tubberwear and used this bag to bring a deconstructed salad to work with lettuce, cherry tomatoes, olives, peppers. big enough to fit everything! Good size for kids snacks and easy to clean fabric make these a win in our house Love the print pattern. Cute and useful bag. A good souvenir for Canada's 150th. Washes well in the washing machine. Super cute pattern and the bag is great.